In 1926, Walt and Roy filed a permit for a three-room artist studio. This was the beginning of the studio at 2719 Hyperion Avenue. 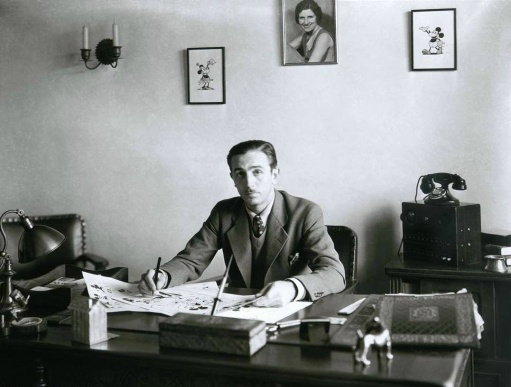 The new studio included two small offices for Walt and Roy Disney, a camera room, and a large partitioned work area for the animators and ink and paint staff. 1927 and 1928 were significant milestones in film making history and in the history of the Walt Disney Studio. 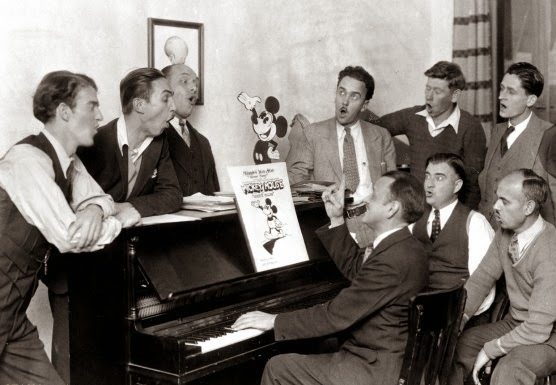 In 1927, The Jazz Singer debuted which was the first feature length film with synchronized sound, and in 1928 Walt lost the rights to his most famous character at the time, Oswald the Lucky Rabbit. Walt saw these events as opportunities and soon introduced Mickey Mouse and the first cartoon short with sound, Steamboat Willie. 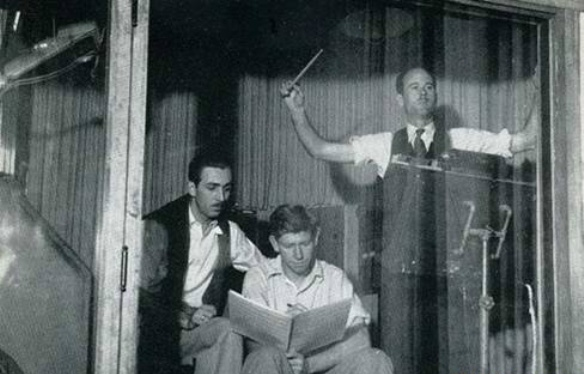 As Walt and his animators became more creative and innovative technically and artistically, the studio had to grow to meet the demands of Walt’s vision. 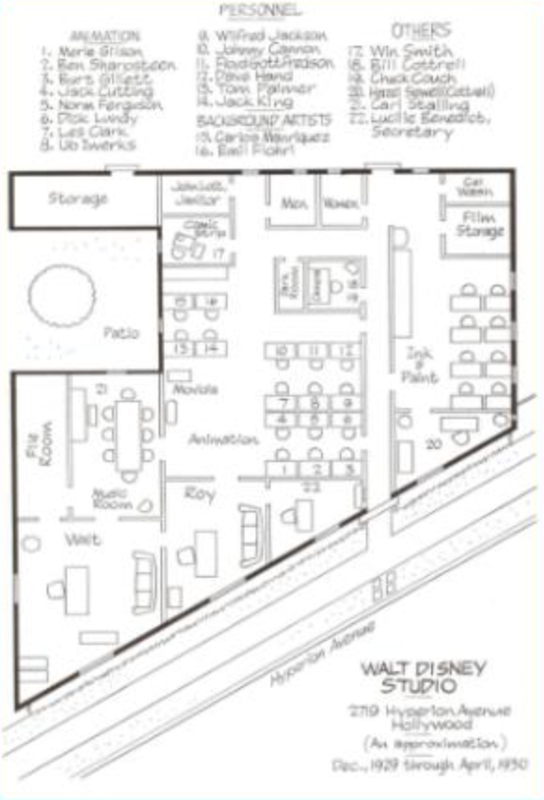 During the next four years the original studio building went through several renovations and additions until a two-story building called “Animator’s Building # 1” and a sound stage were added in 1931. 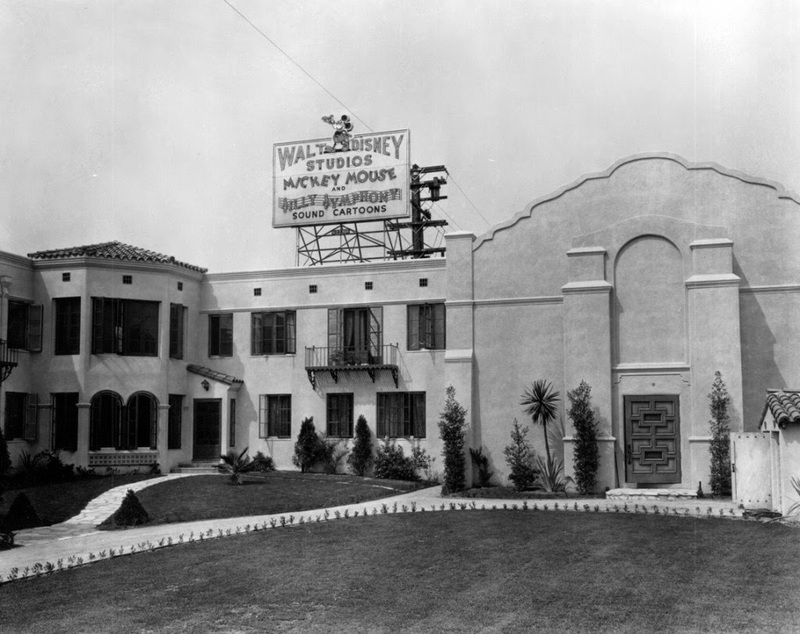 Walt and Roy purchased additional plots of land surrounding the studio and built the “Animator’s Building #2/Shorts Building”in 1934, Ink and Paint and Annex buildings in 1935, and a “Features Building” in 1937. 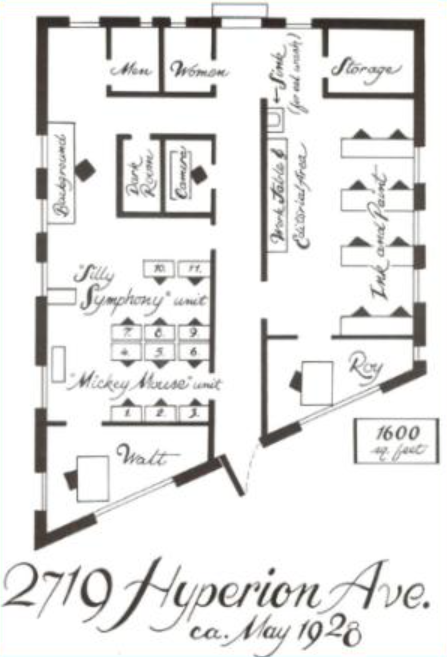 Several other smaller buildings were constructed on the property, including a Wurlitzer Organ building, warehouse, film vaults, sound stage monitor room, camera room, and a garage for Mickey Mouse’s car. By 1939 there was no more room to grow on the Hyperion Studio lot. 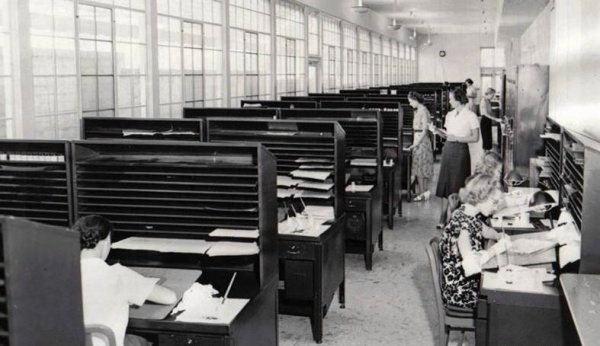 By this time, the Disney Studio had 1,500 employees and the layout of the Hyperion Studio was so haphazard there was a feeling among some that the Hyperion Studio could no longer meet the goals of the Disney Studios. In June of 1938, Walt and Roy paid a $10,000 deposit for a 51 acre plot of land in Burbank and construction on a new studio began shortly afterwards. 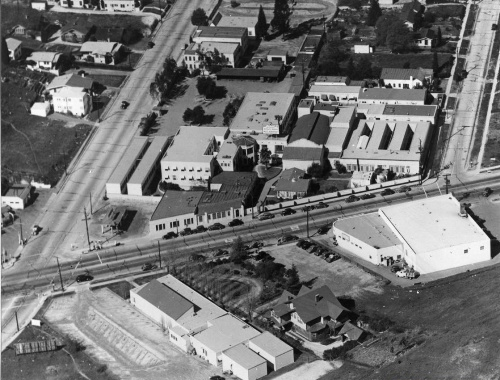 In the fall of 1939, the first staff moved into the new Burbank studios. Walt, being a pioneer in recycling, transported buildings from Hyperion to the new studio in Burbank. 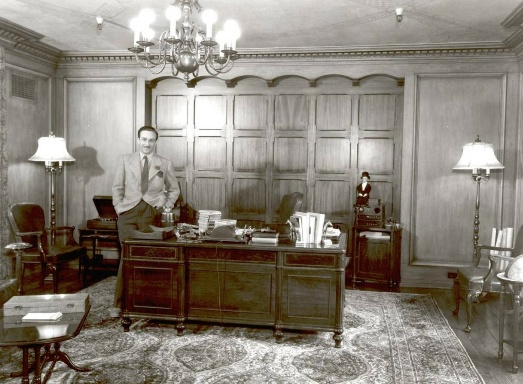 Walt Disney’s renovated office in 1937. Notice the rolled up blueprints for the new Burbank Studio in the right corner. 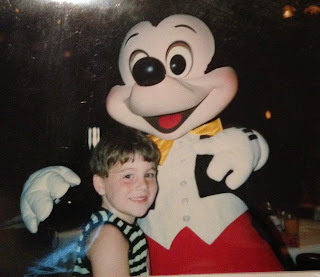 During the short 14 years Walt spent at his Hyperion Studios, Oswald the Lucky Rabbit, Mickey and Minnie Mouse, Donald Duck, Snow White, Pinocchio and many other beloved characters were given life. 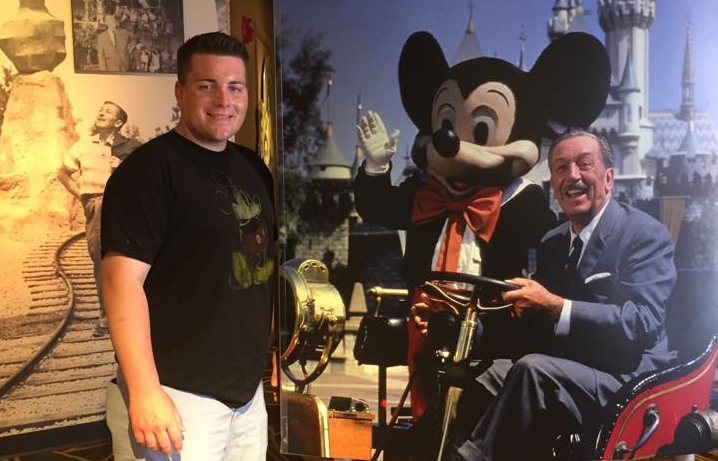 In many ways, the Hyperion Studios represents “the golden age” of Walt Disney’s imagination.